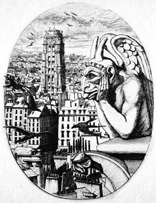 The technique highlighted here is woodcut; a traditional technique renewed by the artist in this piece. It can be compared to similar works by Paul Gauguin, with the same way of rendering space with flat planes in order to produce a stylized distortion typical of Munch's fervid imagination. This large-scale work was done by a "simple” soul, having the "simplicity" of the literary character Chien-Caillou, which is what writer Champfleury called Bresdin. For Odilon Redon, there is no other print “which leaves such a strong mark in your soul, such a vivid and highly original imprint.” Revealing the artist’s process by scouring the details of a work that quotes and reformulates images from other worlds, the film shows how Bresdin created his own unique universe. Born in Pittsburgh, Pennsylvania in 1844, Mary Cassatt moved to France in 1873, where she joined the circles of Degas, Pissarro and Bracquemond. Alongside her Impressionist paintings, she developed an engraving style highly inspired by Japanese prints, but she used etching techniques in new ways, which garnered her wide recognition. 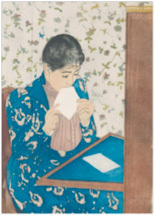 The Letter, a colour dry-point, soft varnish and aquatint (1890-91) is an example of her highly accomplished talent. Old Paris is no more (a town, alas! changes more quickly than man's heart)... The film focuses on parallels between poetic references from Baudelaire to Jouve and the artist’s works representing the regeneration of the city between Saint-Sulpice and Notre Dame. Filming the most important works of this great aquafortist gives insight into the artist's perception—a marriage of precision and folly. This monumental print, with its two adjacent panels, is a seminal work in the history of artistic engraving in Italy. 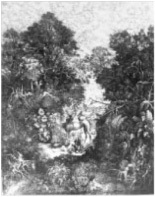 A dramatic and violent rendition of a mythological scene. With Daumier, lithography becomes an art form even as it bears witness to current events. Dating from 1834, this engraving stands at the summit of his career. At once a testimony and a protest against the massacre of Parisian citizens, it transcends its historical moment to achieve timelessness. 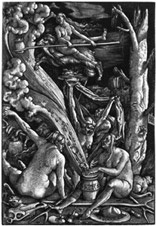 How to show witches—essentially mythical beings—whose representation during the Renaissance was much scholarly as popular. Midway between the surreal and the real, a fleeting moment in the evolution of art. A major work given its size, composition and handling, this engraving blends the myth of the Minotaur, whom the Surrealists had made into an emblematic figure, with the themes of the corrida, or Spanish bullfighting. The dramatic scene is set within a moment of unstable equilibrium..